We're all capable of Lateral Thinking – of thinking sideways, yet still having the natural ability to understand, or to make the mental leap between what is being said and what is being implied. Yesterday, I watched an old episode of “Only Fools and Horses”, a popular British TV sitcom that ran between 1981 to 1991 and even upto the early 2000’s. What I'm getting at is the genius of scriptwriters like John Sullivan, who anticipates an audience's response before conjuring up something brilliant. With “Only Fools and Horses”, he decided that forever and a day the character 'Trigger' would get his best mate's name wrong, without exception. What an indisputably splendid bit of audience understanding to include such a detail. So why do we love this kind of lateral thinking? Probably because we welcome humor more if we've got a bit of work to do to 'get the gag'. It's more rewarding. The point is, Creatives (blokes like me who in the creative industry) bang on about being lateral thinkers... but ask them to explain what lateral thinking is. For me the best analogy is a joke – 'a man walks into a bar... BANG, it was a lead bar' – Okay, so it's a crap joke, but let's face it, in a split second you probably envisaged that man, saw his face, his clothes, where he was, and you had in mind a particular guy with an open door. Yet you were thrown sideways by the punch line, and the bar in question conjured up a completely different picture in your mind – a solid piece of lead piping, with the same guy's face now wedged up against it. The fact that, to a greater or lesser degree, we can all consciously make this sort of leap sideways allows us to take what can only be described as the 'scenic route' to a concept. Getting there is 75% of the reward. And the ability to take an even more oblique route is perhaps the difference between a great idea and a bloody extraordinary idea. To be too obtuse in one's communications is, of course, counter-productive. The more oblique the route, the more likely it is you're going to get lost. Equally, to generate a formula (or road map) for this kind of thinking is clearly impossible. So to make sure we come up with bloody fantastic ideas more often than not, the answer is simply to have an alternative approach, to think in a way that explores all the routes around and between concepts. And anyway, this kind of lateral approach is much more fun than always going in a fixed direction. So, are you thinking now? 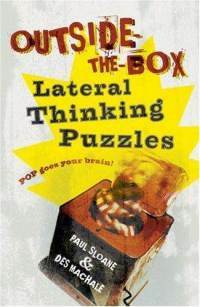 P.S: If Lateral Thinking interests you, read Edward de Bono's "New Think: The Use of Lateral Thinking", "Parallel Thinking: From Socratic thinking to de Bono Thinking" and "Six Thinking Hats: An Essential Approach to Business Management". All the 3 books are a great read and proof why de Bono is perhaps considered one of the greatest thinkers of all time!